“A truly great book should be read in youth, again in maturity and once more in old age, as a fine building should be seen by morning light, at noon and by moonlight”.- Robertson Davies, Canadian novelist and critic (1913-1995). THIS piece was propelled by two events, one was the Annabel Leadership Summit and the other was a brilliant article by Dr Ayo Olukotun (a professor of Political Science and dean, Faculty of Social Sciences and Entrepreneurial Studies at Lead City University, Ibadan). Attending the Annabel summit which took place on the 11th and 12th of December 2012, was refreshing in that the delegates were told the unblemished truth by Pat Utomi that readers are leaders and leaders are readers. From Leo Stan Ekeh, Nicholas Okoye to Tonye Cole, Ali Baba and a host of panellists, they all sang the same chorus and hymn albeit in different tunes-read, read and read. But this writer concluded that a lot of the delegates consisting of youths were labouring under some severe form of misapprehension such as unavailability of enabling environment, job creation by the government, cronyism and favouritism in the employment procedures of corporate Nigeria, to name a few. This writer has held the notion that trucks-load of the upwardly mobile youths of this generation are not well-versed except in the latest dancing steps and lurid songs and accompanying voyeuristic videos to hit the airwaves. There seems to be a steady rise in the poverty of the mind amongst this generation. Attending the summit confirmed the held notion. A panellist asked if any delegate knew the name of his/her senator or House of Representatives’ member. And the collective response was slightly varied but similar-“how would we know that?” This writer was baffled that a lot of the delegates had momentary amnesia and forgot there was and still is a search engine called Google on their “sixth sense- touch-screen” smartphones (which is rapidly becoming a fashion accessory rather than a necessary tool). If the message disseminated on the first day of the summit wasn’t crystal-clear, the stand-up comedian Ali Baba on the second day, without caring whose ox was gored stated that people have to read and continue reading. He was appalled by the mental capacity of job seekers who he encounters on a daily basis and the bombardment of outrageous “verbicides” and “Englishcides” by some of his job-seeking followers on Twitter. Reading some tweets twitted to the comedian, any curious visitor to his twitter page(s) would ponder if such people were “specially commissioned” by the Queen to murder the English language! He reiterated the fact that it is because of his well-cultivated reading habit that he has remained relevant in the comedy industry. And he said he has a huge library of books on diverse themes where he picks his sublime, intellectually witty jokes from. On the article by Prof. Ayo Olukotun on the 21st of December 2012, on Ynaija.com which was titled, “what does President Jonathan read?” What this writer gleaned from the article was that it is quite easy to verify what books Heads of States of countries like Germany, America and UK are reading i.e. an official list of books to devour, alas, it is impossible to get such important data on Nigeria’s president. In Olukotun article he had stated, “of course, it is well known that United States presidents maintain an official reading list of books, by which they not only improve their minds but rejuvenate a flagging national reading culture by force of personal example”. He made reference to the late Dr Macebuh’s article in which he, Macebuh (a prominent columnist) was part of a government delegation; onboard the same plane to China with President Obasanjo as a military head of state in the 70s and President Obasanjo was seen reading an intellectual book. Dr. Macebuh opined that probably due to his voracious reading culture then, “he (Obasanjo) avoided self-succession and set a democratic precedent at a time when sit-tight rulers mushroomed on the continent”. Francis Bacon (1561-1626), the famous English philosopher once stated that “some books are to be tasted, others to be swallowed, and some few to be chewed and digested”. Undoubtedly, the Holy Bible falls into the three categories. But apart from this, what books are a majority of Nigerians reading? Succinctly put, what books are upwardly mobile youths reading? Fifty shades of grey and the likes or the wealth and poverty of nations, the fortune at the bottom of the pyramid, autobiographies of great leaders or closer to home, Chinua Achebe’s There was a country? A book this writer after reading the first chapter had to put aside because it needed this writer’s full concentration when it was discovered the book is a writer’s classic and delight due to several observations, e.g. the simple play with words. A close friend (Harry Okoh-a modern day version of Soyinka and Achebe) who reads the UK’s Daily Telegraph to search for the weekly 10 books to read, once notified this writer that one of the major differences between Nigerian leaders and the led is that a majority of the leaders read and devour books while a majority of the present generation don’t read but would rather be chronic and unabashed showbiz enthusiasts and wannabes. Furthermore, the appalling dearth in the reading habits of Nigerian youths isn’t ameliorated by the over 80 per cent of only entertainment content invading silver screens like the Tsunami, courtesy of local stations. Nigerian leaders have realised that the quote by the British art critic John Ruskin (1819-1900), which goes thus “if a book is worth reading, it is worth buying” is true. The salient truth is that a well-read mind is in a more advantageous position than a mind which doesn’t read, glean or seek information for mental and personal growth. A gathering of serious minded people mingling and conversing would convince any sceptic on the relevance of reading. Lumina Foundation which gives out the Wole Soyinka Prize for Literature must be commended for encouraging reading in Nigerian primary and secondary schools through 63 Wole Soyinka Reading Clubs in the country and by working with 84 libraries. For those leaders who don’t read or fail to read enough, their leadership would be characterised and riddled with snail-speed struggles and ready-made excuses for the simplest of clarifications and explanations. Here, a Mark Twain’s quote readily comes to mind, “there are a thousand excuses for failure but never a good reason.” For the youths who don’t read, they would continue to be part of the bandwagon of the present day Nigerian youths who clamour for change but don’t have any inkling on how they can play their own part in effecting the desired change. If majority of youths read books, the clamour for change would have moved up a notch and be more refined and strategic in all ramifications. Reading is quite easy. A book a month for slow-paced “perusers”. This writer has a list of over 100 books (and counting) to be read in a lifetime. The books lined up, to be read from January 2013 have been devoured and still counting. But this sudden, drastic and deliberate change in this writer’s reading habit was instigated by some encounters with the publisher of Hallmark newspaper in November 2012, who informed this writer that enough books weren’t being read by this writer(a shock but a piece of advice coming from a former Commissioner of Information of an Eastern state should be heeded). After this piece was initially completed by some form of Providence, this writer met a unique lad. Consequently, this piece won’t be complete without a mention of the recent encounter with this young lad who sells books at CMS (directly opposite the CMS Cathedral Church). On Friday, January 11, 2013, this writer decided to get some books. He spotted a young lad settling down for the day’s business, arranging his large collection of books. During his selection process, this writer asked the lad if he read the books he sold. An affirmative was the response. Not only that, he reads any book his serious-minded customers bought. To my surprise, the young lad by the name Chinedu Okorie had read Chinua Achebe’s book-There was a country—and did an instant oral review of it for me. The boy was admonished to keep on reading and that very soon he would be spotted for his analytical mind and his reading would stand him out in a crowd. Apparently, there is a glimmer of hope for this present generation, but it may not be found in the midst of graduates of this generation but probably in the midst of the public secondary school graduates who Nigerians see selling books. Three quotes on the relevance and validity of reading would summarise this piece. In 1981, Chief Obafemi Awolowo (1909-1987) said “in honest hands, literacy is the surest and the most effective means to true education. In dishonest hands, it may be a most dangerous, in fact a suicidal acquisition”. One begins to ponder if he saw the future. But it is well-known that avid readers tend to analyse and consciously or subconsciously make near-accurate predictions. Yarn Martell (Canadian novelist) is quoted as saying “the reading habits of politicians matter because in what they choose to read will be found what they think and what they will do”. 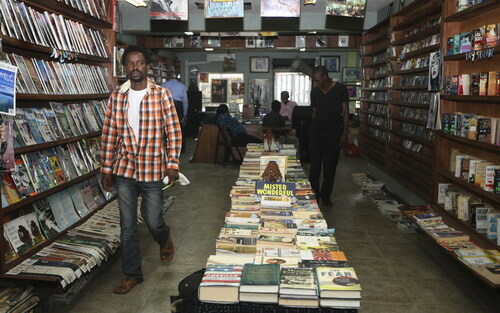 Nigerians would appreciate the availability of the list of books to be read by their leader in 2013. Nigerians know how a lot of elected officials think via their utterances. Back to that event of the December 11 and 12, 2012, it was glaring to all and to those who didn’t know that reading coupled with self-discipline is the only way to attain individual, collective and national greatness (it is what would make anyone different from the crowd). And so, when two of the panellists requested for a slogan, after much ruminations, this writer rather, conjured up a quote “leadership is a cumulative reflection of the astuteness or ignorance of the followership”. • Aina lives in Lagos. NLC’s position on constitution amendment.